It was a moving scene as thousands of candles glittered in the descending dusk in London's Hyde park this evening during the vigil for the eve of Cardinal Newman's beatification. The Holy Father's transit took nearly an hour as the popemobile snaked leisurely through the streets amid the cheering faithful; many of whom were bearing flags, banners ...and babies. One such baby was handed through the repeatedly opening windows of the popemobile despite the high-level security measures that warranted their being closed whilst in transit. 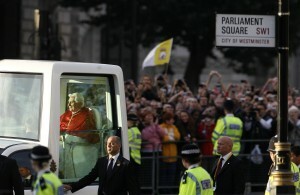 The popemobile pulled into the WYD-esque scene in Hyde Park just before dusk. Here, he proceeded to lead the faithful in prayers and a reflection on the life of Cardinal John Henry Newman. Newman would describe his life’s work as a struggle against the growing tendency to view religion as a purely private and subjective matter, a question of personal opinion. Here is the first lesson we can learn from his life: in our day, when an intellectual and moral relativism threatens to sap the very foundations of our society, Newman reminds us that, as men and women made in the image and likeness of God, we were created to know the truth, to find in that truth our ultimate freedom and the fulfilment of our deepest human aspirations. In a word, we are meant to know Christ, who is himself “the way, and the truth, and the life” (Jn 14:6). The Holy Father said that if we are looking at the world "realistically", we will admit that for Christians it can never be "business as usual" but instead that we must pray for the uprising of saints in our generation. We know that in times of crisis and upheaval God has raised up great saints and prophets for the renewal of the Church and Christian society; we trust in his providence and we pray for his continued guidance. But each of us, in accordance with his or her state of life, is called to work for the advancement of God’s Kingdom by imbuing temporal life with the values of the Gospel. Each of us has a mission, each of us is called to change the world, to work for a culture of life, a culture forged by love and respect for the dignity of each human person. As our Lord tells us in the Gospel we have just heard, our light must shine in the sight of all, so that, seeing our good works, they may give praise to our heavenly Father (cf. Mt 5:16).